Who can resist the succulent pork ribs? 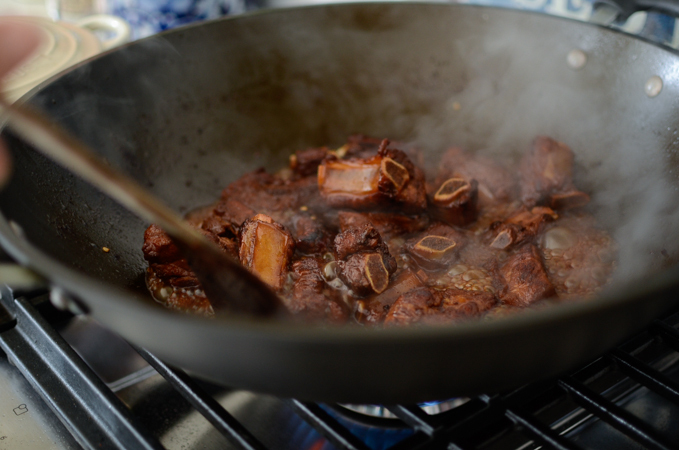 Chinese sweet and sour pork ribs are always welcomed in my house any time of the year. 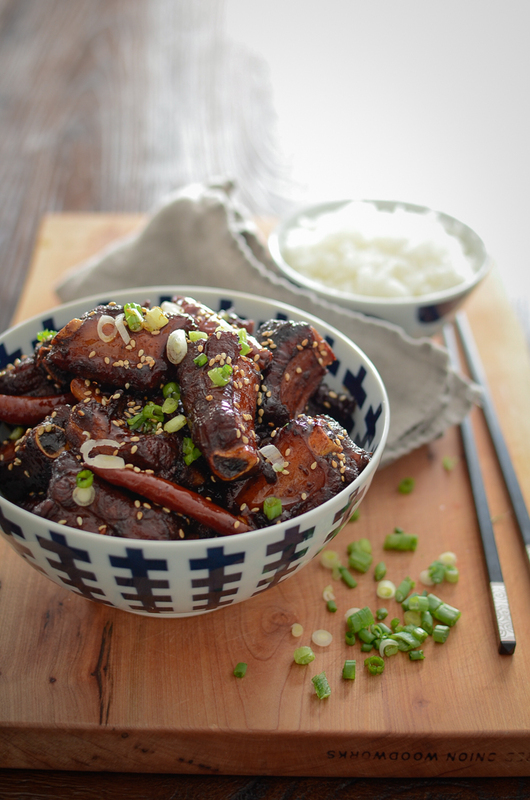 Of course, I like Korean version of pork ribs, too, but the Chinese version is so much easier to make. I highly recommend to par-boil pork ribs in boiling water for 4-5 minutes first. This will get rid of unclean residue on the bones and remove some of the fat as well. Drain and rinse the ribs a few times under hot water and set aside. Heat oil and add the sugar. 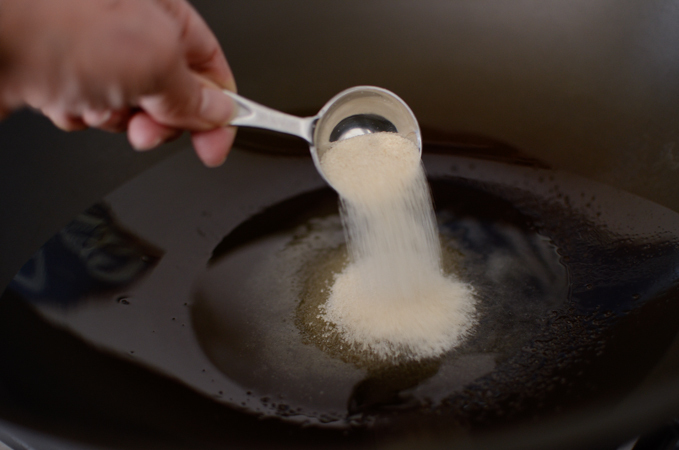 Keep stirring until the sugar gets caramelized. It will turn red in no time. 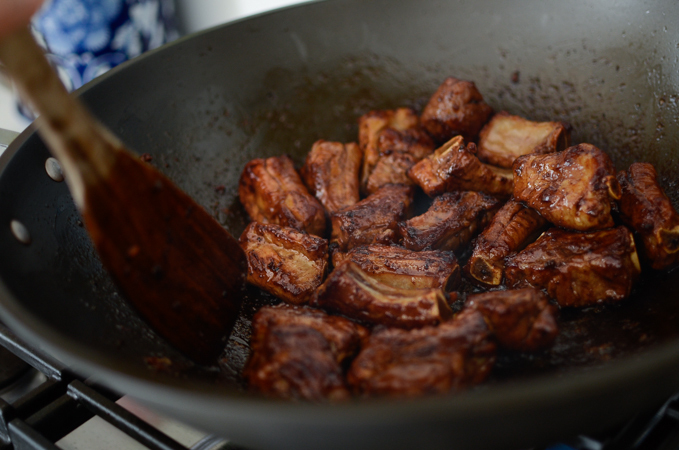 Quickly add the pork ribs and stir-fry for 2-3 minutes so the sugar coats to the ribs. 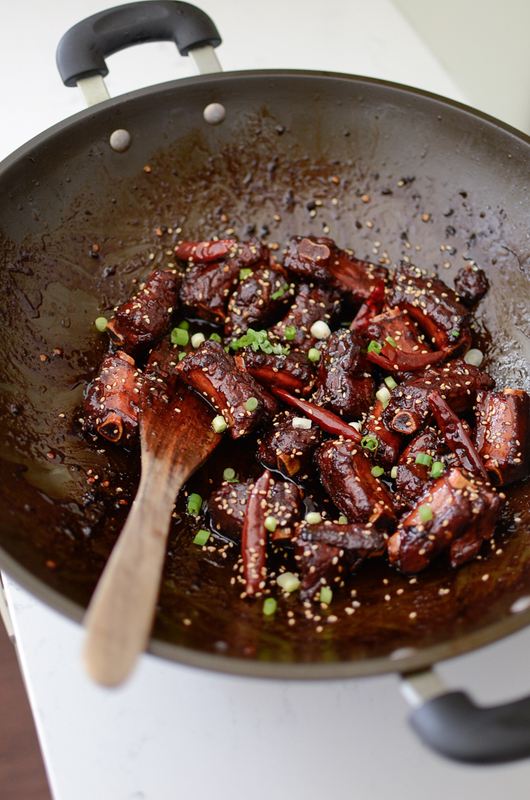 You will need shaoxing wine (Chinese rice wine), chinkiang vinegar, and dark soy sauce. You will also need everyday regular soy sauce, sugar, chicken stock, and dried chilies if you like a heat. Add the vinegar and soy sauces. Then add the chicken stock, dried chilies, ginger and green onion. Cover with a lid and bring to a gentle boil. Reduce the heat to low and simmer for 25 minutes. When the simmering is done, remove the ginger and green onion. Turn up the heat to high and start thicken the sauce stirring constantly . You might need to adjust the heat level to avoid burning as the sauce gets thickened. Shiny gorgeousness, right? Sprinkle some chopped green onion and toasted sesame seeds as a garnish, and they are ready to serve. 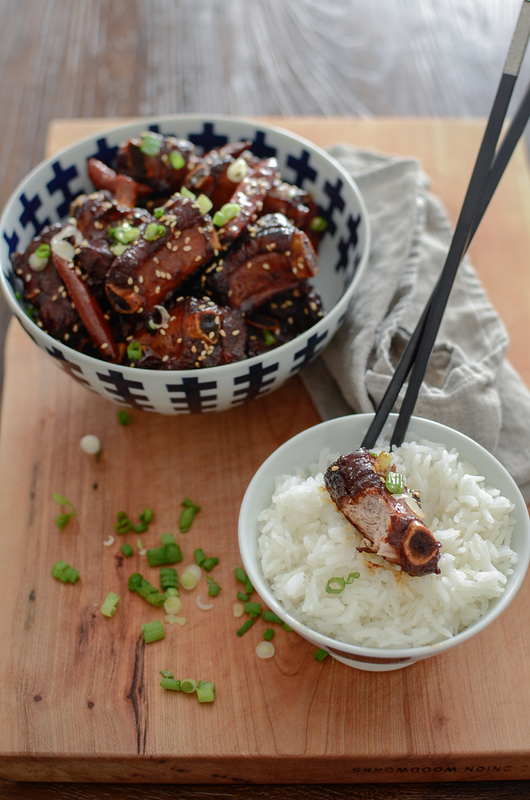 You will love the gentle sourness and sweetness of these ribs. 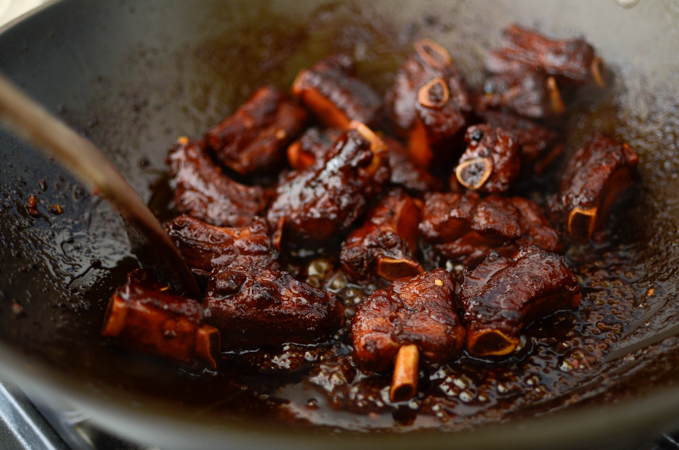 I will tell you that this Chinese sweet and sour pork ribs are finger licking tasty. 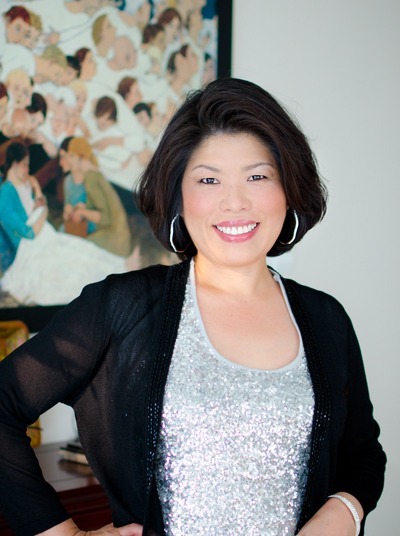 They will satisfy your Asian food craving with a big smile on your face and anyone whom you serve to. Enjoy~! 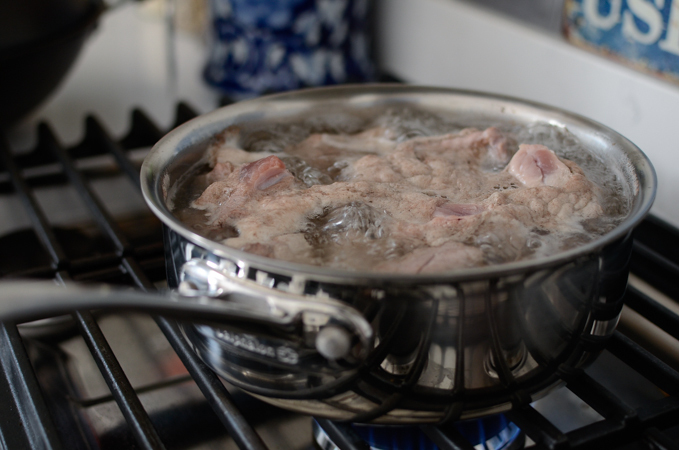 Put pork ribs in a pot and pour water to cover. Bring it to boil and cook for 3-4 minutes over high heat. Drain and rinse under hot water. Put them in a colander and set aside. 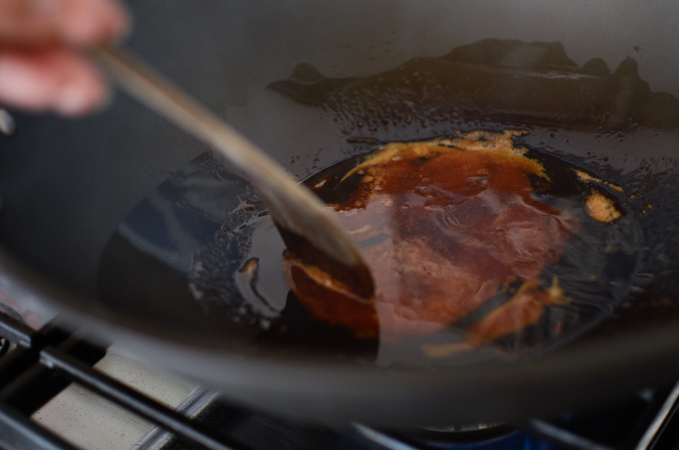 Heat 2 tablespoons of oil in a wok or a large skillet. Sprinkle sugar and let it caramelize over med-high heat as you stir. 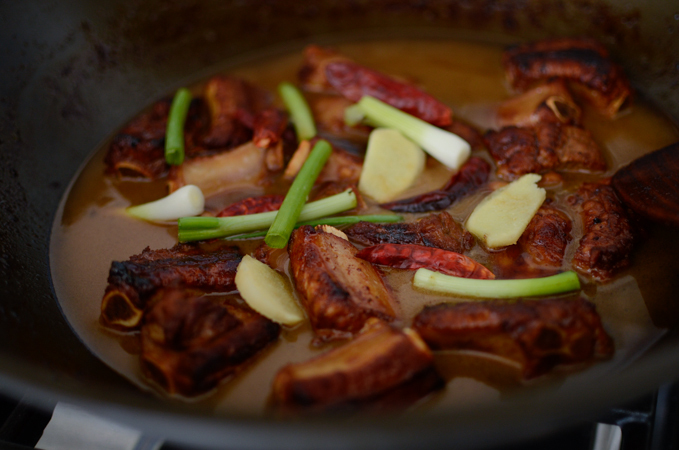 When the sugar turns red, add the pork ribs quickly and stir to coat. Keep stirring for 3-4 minutes. Add the soy sauce, vinegar, chicken stock, chillies, ginger and green onion. 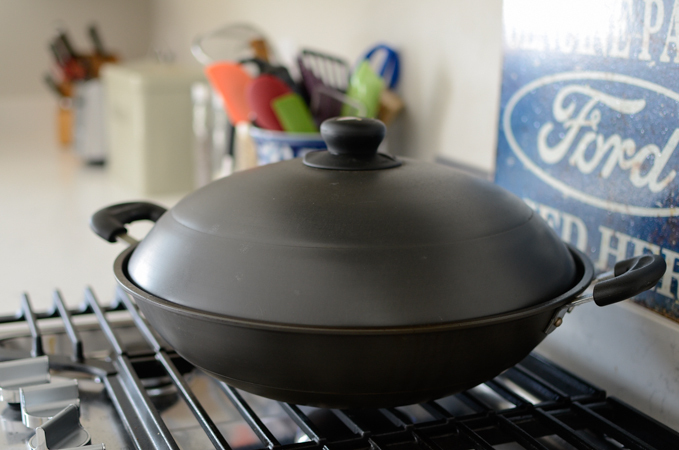 Cover with a lid and bring it to a gentle boil, then reduce the heat to low and simmer for 20-25 minutes. Uncover the wok and remove the ginger and the green onion. Raise the heat to high and thicken the sauce as you stir occasionally. 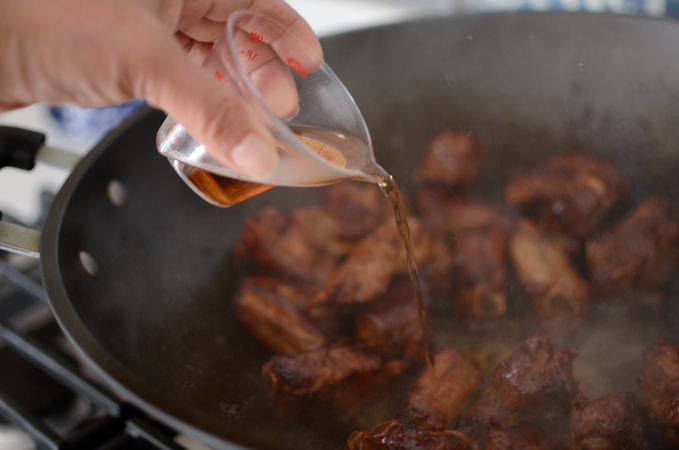 When the sauce starts to thicken and turns into a glaze, reduce the heat a little so that you don't burn the sauce. Continue until it becomes a very thick glaze to coat the ribs. Remove from the heat and garnish with toasted sesame oil and chopped green onion, if you wish. My mouth is watering just looking at those ribs?? Thanks. They are indeed tasty. I think so. I haven't tried with beef but it should work fine. 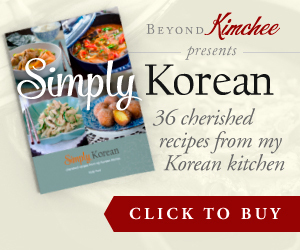 Hi, this recipe looks amazing! 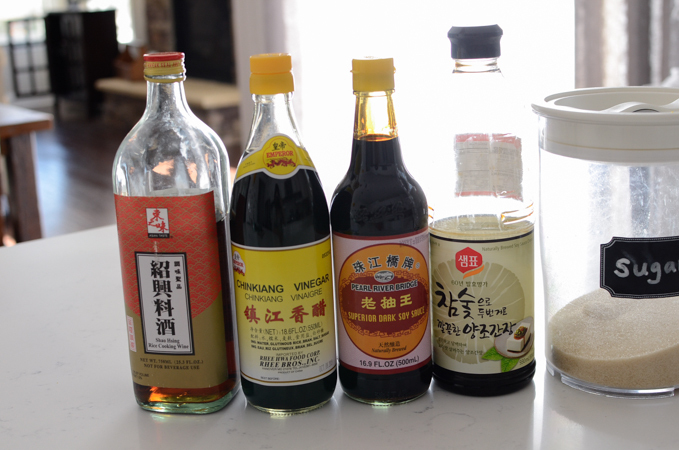 Is there a substitute for brown rice vinegar? Hi Holly, Thanks for sharing this receipe. I actually made just now and it tatse amazing. just wondering though, you did not mention the wine in the procedure. I actually did not include it. but it work just fine.. thank so much.